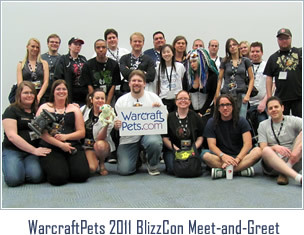 WarcraftPets 2013 Meet-and-Greet at BlizzCon! We'll be holding our customary Meet-and-Greet at BlizzCon this year, and all pet lovers, collectors and battlers are invited! Unfortunately, the majority of our Admin team will be unable to attend BlizzCon this year. However, our awesome community leader, Doobjanka, will be hosting TWO Meet-and-Greet events — one each day of the convention. Steve, our good friend from WoWTCGLoot.com, will also be joining us and providing the first 50 people to attend each day with a free common TCG loot card! Two sessions for your convenience. Come to one or both! Everyone is welcome to stop by and say hello, chat about pets and battling, and all things WoW! Be sure to follow our Twitter feed, just in case there are any last minute changes or announcements. WoWTCGLoot.com has generously donated a pet Rocket Chicken that we'll be raffling off after the convention. To enter into the drawing, simply sign our Meet-and-Greet roster with your WarcraftPets username. Only registered site users will be eligible for this drawing.